Clark Kent and Lois Lane arrive in the town of Silsby to write an article on the Havenhurst oil well, which has drilled six miles down beneath the Earth’s surface. Just as they arrive, they find that the well has been closed down. As they settle into the town’s hotel, a watchman at the site is killed. Investigating the death, they learn of reports of small creatures. Clark believes the creatures are mole men who have come up from the centre of the Earth, having been disturbed by the drilling. As the mole men venture into the town, locals drum up a lynch mob to hunt them down. Clark is forced to step in as Superman to protect the creatures who are innocent of wrongdoing. Superman and the Mole-Men was the first feature film appearance of Superman (although at 58 minutes in length, it barely even scratches that definition). Superman had only first appeared in Action Comics #1 thirteen years earlier and quickly gained a high profile throughout the 1940s via a radio show and a popular series of animated cartoons. His first actual live-action film appearance was in the serials Superman (1948) and Atom Man vs Superman (1950) where he was played by Kirk Alyn. The success of these led to the idea of transferring Superman to the very new commercial medium of the day – television. 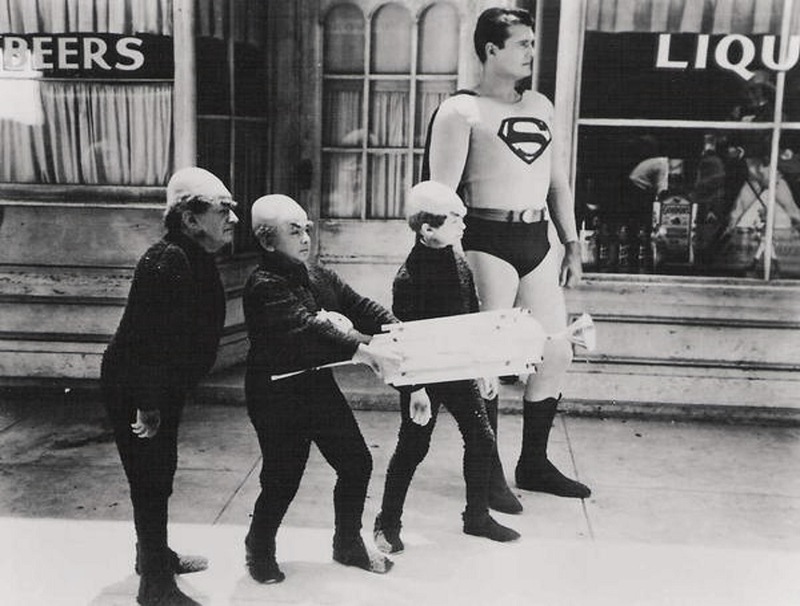 The studio was unsure about the viability of a tv series and so decided to conduct a dry run by making a film for theatres first with Superman and the Mole-Men. Kirk Alyn wanted too much money to reprise the role so Superman was recast with a relatively unknown actor by the name of George Reeves. The film proved successful and paved the way for the tv series to go ahead. The resulting series Adventures of Superman (1952-8) was a great success during its day, being one of the first to be filmed in colour from the third season onwards. (Superman and the Mole-Men was subsequently recut as the two-part episode The Unknown People, which served as the finale of the show’s first season). 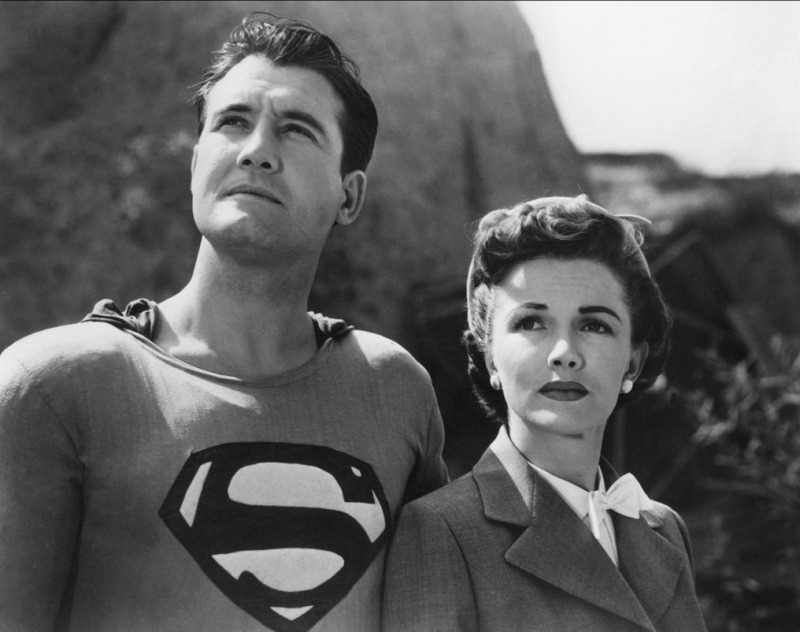 The series was cancelled following the death of George Reeves in 1959 – for which see the film Hollywoodland (2006). Superman and the Mole-Men is an oddity when you come to it after a familiarity with the comic-book Superman, the Christopher Reeve films and especially the dark and grim Superman of Man of Steel (2013). Firstly, you have to understand that up until around the point of the Christopher Reeve Superman (1978), film and tv superheroics were limited. There was no such thing as CGI, while the films/shows were made on budgets that lacked much if anything for visual effects. Superpowers were limited to things like Superman punching through a wall or Lee Majors running in slow-motion accompanied by a cranking sound to represent his powers in The Six Million Dollar Man (1973-8). When Superman and Captain Marvel flew, all we would see is the respective actors pulled up off-screen on wires and then maybe a shot of them against back-projected sky. Wrinkles were readily visible in the tights of the costumes. With the exception of the madly over-acting guest stars in tv’s Batman (1966-8), there were no such things as super-villains and the plots were mundane ones – chiefly, one suspects, because the writers were not comic-book readers but came from backgrounds in writing crime and spy shows and simply adapted those plots to have superheroes tackling bank robbers and petty criminals as opposed to world-threatening menaces. In the film here, Superman’s exploits are limited – he bends the barrel of a rifle, bullets bounce of his chest and that is about it. There are a couple of scene where he flies (where his takeoff and landing is accompanied by a jet engine sound! ), which consists of the old trick of George Reeves being lifted up off screen on wires followed by some POV shots looking down at the street as he flies over. We get a single wide-angle shot where an animated outline of his figure flies up to the top of the dam to save a Mole Man after he is shot, although this is very brief and quickly cuts back to a medium shot of Reeves on wires catching the Mole Man in his arms. Even as a superhero story goes, the first half is centred around the thoroughly mundane plot of Clark Kent and Lois Lane investigating a dead body at the local mine. In fact, this is the oddity of a Superman film where Clark Kent gets far more screen time than Superman does. Even then, the action is taken up by scenes that don’t involve either, like where a lone Mole Man is pursued through the desert, culminating in a long scene where the locals corner him in a hut and set it on fire where you keep expecting that Superman is going to turn up and save the day, only for this to not to be the case. Superman and the Mole-Men came along a little early for the great alien invader fad of the 1950s but it holds some interesting allegiances to it. It was released to theatres one month after The Day the Earth Stood Still (1951). By contrast to almost all alien invader films, which took the view that their arrival was inimical and a deadly threat that must be fought off, both The Day the Earth Stood Still and Superman and the Mole-Men are among the few films of the decade where the arrival of visitors from elsewhere is not necessarily something threatening and that the greatest menace proves to actually be human prejudice. While The Day the Earth was about a trigger-happy soldier, Superman and the Mole-Men has Superman standing between the innocent child-like Mole-Men and a lynch mob of angry locals who are determined to kill them. Lee Sholem was a director of B-budget Westerns and adventure films during the 1940s and 50s. He made his directorial debut with the first two Lex Barker Tarzan films Tarzan’s Magic Fountain (1949) and Tarzan and the Slave Girl (1950). He directed Johnny Weissmuller in two of his non-Tarzan jungle adventure films Jungle Man-Eaters (1954) and Cannibal Attack (1954). Sholem also made several other B genre films with the robot film Tobor the Great (1954); the mummy film The Pharaoh’s Curse (1957); and the sf film The Doomsday Machine (1972).